Thomas Bjorn and Rory McIlroy have joined Graeme McDowell in the growing band of European Tour stalwarts backing Pádraig Harrington for the Ryder Cup captaincy. But while it will be three months before the European Tour's CEO Keith Pelley sits down with Bjorn, his predecessors Darren Clarke and Paul McGinley and a player from the Tournament Committee to name the man to lead Europe's defence at Whistling Straits, it appears that Harrington is already ahead of the game. With Lee Westwood understood to be happy to wait until Rome in 2022, it appears a safe bet that the Dubliner will be leading the troops on the appropriately named Irish Course at the windswept Wisconsin venue in two years' time. And while he's simply saying for now that he'd love to do the job someday, he admitted he's been taking notes about the intricacies of the event since he made his debut at Brookline in 1999. With that kind of dossier at his disposal - six playing appearances to go with three vice-captaincies - few come close to Harrington in terms of experience. "Oh, he'd be brilliant," a jaded but beaming Bjorn said in a morning-after-the-night-before chat as workers began dismantling the huge Ryder Cup set-up at Le Golf National. "He's got all the tools and all the knowledge. They will all be quality, if they do it or when they do it. But let's leave that one for a couple of months." If he gets the job, it will be interesting to see if Harrington surprises as many as Bjorn, who was described in glowing terms by McDowell as "more low stress than I imagined him to be because he was a high-stress golfer". McIlroy believes Harrington would be a good captain in the United States because "he's won a lot of golf tournaments over there", including a PGA Championship. "I think the continuity in the European camp having all these vice-captains this year and preparing for captaincy down the road has been a huge foundation of why we've been so good," McIlroy said. 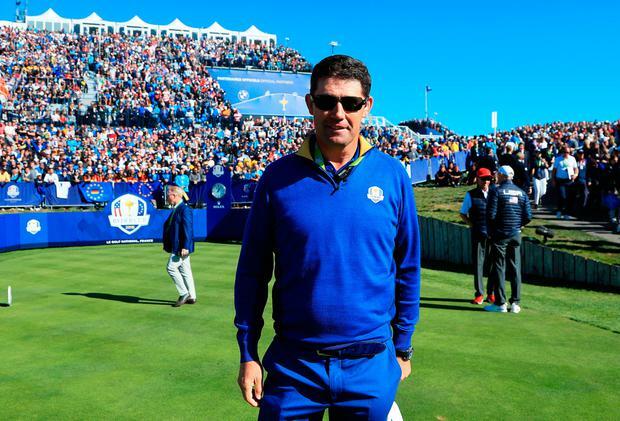 Harrington knows that winning a Ryder Cup away from home is doubly difficult given the kind of home-course advantage enjoyed by Europe in Paris. But he's already thinking ahead to what the 2020 captain might face and he sees the course at Whistling Straits as less advantageous to an American victory than many might imagine. "A neutral set-up is not going to happen for 20 or 30 years," Harrington said. "But if a European were to pick a course in the States, we'd pick Whistling Straits. Why? Well, it's a windy links golf course, and it could be quite cold at that time of year. It is not like they can get the greens super quick that week. They will work to play to their strengths but it is a course, due to the nature of it, that has some European qualities." Henrik Stenson and Ian Poulter will be 44 in 2020, Paul Casey will be 43 and Sergio Garcia and Justin Rose will have turned 40. "A few will drift away but there will be a good bit of this team there," said Harrington, who already has some names in mind. "There are some nice players who missed out this time. Somebody like Matt Wallace is a player for the future coming strong. "At a US golf course, you are looking at players like Thomas Pieters, who makes a lot of birdies. Maybe a different style of player is needed. That will come out later. It's not necessarily the best 12 players, what you need is the best 12 for a team." And while Greystones' Paul Dunne wasn't fetching any coffee this year, he was in Paris as a guest of the European Tour alongside three other future stars, the Dane Lucas Bjerregaard and Spaniards Adrian Otaegui and Jorge Campillo. Given the succession planning going on inside the team room, it appears the European Tour leaves few stones unturned when it comes to prepping future talent for a possible trip to the American midwest in two years' time.